Hello i3 owners. 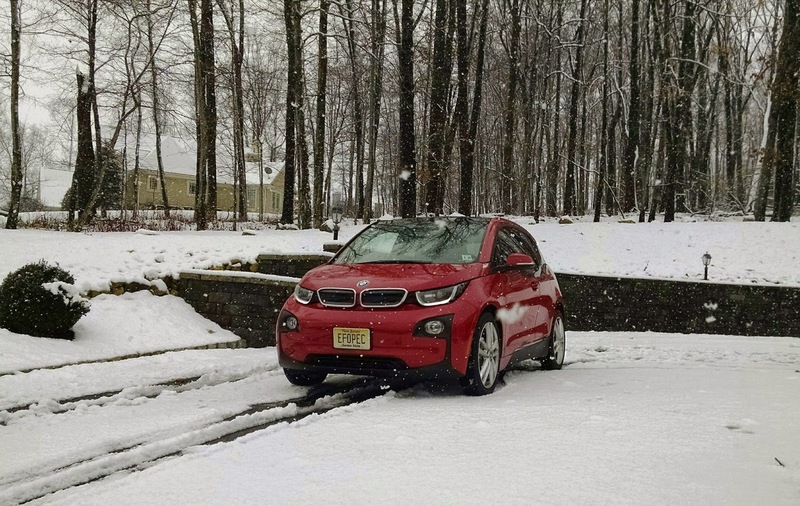 I know many of you early adopters have already lived through a winter with your i3, (or perhaps a previously owned EV) but I'm sure there are also many who haven't. For those that live in areas where the temperatures drop significantly in the winter months, you're about to see a reduction in the car's available range due to the cold weather. This isn't an i3-specific problem, all electric vehicles experience this issue when the temperatures drop. There are precautions you can take, and pro-active planning like using the i3's preconditioning feature to minimize the effects of the cold. I've prepared a blog post to further explain this topic, and offer advice to help get you through the winter with minimal inconvenience. A lot of good data in the blog, but here are a few empirical data observations from the recent arctic blast into NY/NJ. BEV fully charged and preconditioned in the garage, driven outdoors in the evening: GOM range estimated at 60 miles. BEV parked outdoors overnight: GOM range in the morning on day 2 estimated at 48 miles (pre-conditioning ran on battery power alone before I got in the car, battery charge dropped to 86%). I don't know how much of the battery SOC drop should be attributed to pre-conditioning drain vs. temp drop. BEV plugged back into an L2 charger, preconditioning ran off the circuit: GOM range estimated at 58 miles. I had the same BEV loaner in the summer and the fall (temps in 40s-50s), and with my driving pattern, the full-charged morning GOM was ~90 miles in the summer, and ~75 miles in the fall. The empirical observations and GOM projections are broadly inline with each other. P.S. : I normally drive 2014 i3-REX, but it was in for service (again, nothing crazy), thus 2014 i3-BEV used for the above observations. P.P.S. : I miss my REX badly. There were a few trips on my weekend to-do list that would normally be made in the REX, but based on the borderline range of the BEV, I took the ICE car instead. I am writing about warm weather and range. Here in Southern California the temperature was in the mid 70s today. I did a round trip of nearly 85 miles on my i3 REx and the REx kicked in just as I was reaching my drive way. After beginning a charge an hour or so later, the full charge according to my BMW i3 app is 91 miles. These are better ranges than I've ever experienced in the past from the time I purchased the i3 in July, 2014. Not complaining. Just reporting. I have no answer for these great ranges but I hope they will keep coming. Perhaps its the weather, but I also wonder whether it is associated with a recent repair to the REx that took my dealer nearly two weeks to complete. The part came from Germany was on back order. The part controlled more than the REx so far as I can tell so this may be contributing to my great ranges. I have no answer for these great ranges but I hope they will keep coming. Perhaps its the weather, but I also wonder whether it is associated with a recent repair to the REx that took my dealer nearly two weeks to complete. The part came from Germany was on back order. The part controlled more than the REx so far as I can tell so this may be contributing to my great ranges. I went through a similar delayed repair "waiting for parts from Germany" about two months ago, and the culprits were parts for engine mounts. Per BMW SIB 22-01-15, dealer replaced engine mount bolts and some other parts (see list below). This did nothing to solve my suspension clunking problem, but did take about 2 weeks and allowed me to experiment with the i3 BEV for the duration. After any repairs, dealers usually upload new software for the car. That process rests GOM adaptation values to factory default - highest possible GOM estimates ;-). The latest for i3, reduce torque at start-up (to minimize strain on said engine mounts), which should have marginal positive impact on mileage. I am writing about warm weather and range. Here in Southern California the temperature was in the mid 70s today. I did a round trip of nearly 85 miles on my i3 REx and the REx kicked in just as I was reaching my drive way. After beginning a charge an hour or so later, the full charge according to my BMW i3 app is 91 miles. These are better ranges than I've ever experienced in the past from the time I purchased the i3 in July, 2014. Not complaining. Just reporting. Ambient temps in the 70s are ideal for maximum range. BMW programmed i3 heating/AC system to keep the battery compartment within a narrow temperate range around 68F. Even if you are not heating or cooling the passenger compartment, the batteries are drained to heat or cool (as appropriate) the battery to keep it in the desired temperature range. The only way to avoid that drain is have ambient temps near that 68F mark, which is what some parts of the country have right now (and others, like SoCal, almost year around). The best range I ever got out of my i3-REX was exactly 100.0 miles last fall, before REX kicked in with 6 miles left on the battery. The temps were roughly 70F ambient. Or, roughly, 5.7 miles/KWh. Driving on back roads (as opposed to highway speeds) helped maximize range that time around as well. Driving at highway speeds in single digit F weather produced the opposite results, with my winter mileage frequently dipping into mid/high 2.x miles/KWh range.